The nice thing about country kitchens: there are so many distinctive elements in them, you can easily pick and choose to create your own adorable space. Generally, you're talking about kitchens that feel handcrafted and homespun. They are bright and cheery, with open shelves, painted or rustic wood, colorful curtains and wicker baskets. In country kitchens you can visualize your granny home-canning peaches for the pantry and cooling a fresh apple pie on the window sill. 1. Cabinets: Country-kitchen cabinets are often brightly painted, sometimes distressed and with an antique glaze--an easy do-it-yourself project. But your cabinets don't have to be painted. A light natural wood, such as maple or beech will work, as well as more rustic woods, such as hickory or knotty alder. If you want to replace your doors, a simple maple Shaker-style door is $18.50 a square foot through KitchenDoorDepot.com. Raised-panel doors are $24 and $25. But shop around--a local cabinetmaker might match or beat online prices. 2. Hardware: Why not change your knobs, pulls and hinges? Pewter, brushed nickel, oiled bronze and rusted iron are all country-kitchen possibilities. Or you could opt for glass or ceramic hardware. Prices range from a couple of dollars each to close to $7 at Home Depot, and there are numerous online shops. 3. Shelves: Country kitchens like to have open shelves for displaying knickknacks, cups and such, so why not build some end shelves or a shelf over your sink window. If you or your spouse has some do-it-yourself talent, shelves are an easy project. 4. Pot rack: Cookware in country kitchens is visible and available. A pots-and-pans rack puts your cookware at hand instead of inconveniently stashed in drawers. The rack can hang over an island or if you have plenty of cupboards, you might remove one and hang your pans there. And you might add a shelf under the pans. Racks can cost from less than $50 to a couple hundred dollars--eBay is a great place to check for a bargain. 5. 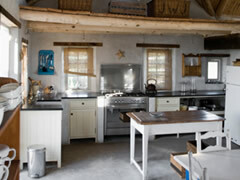 Decor: Just changing your décor can countrify your kitchen. You can add gingham curtains and a valance; woven baskets on the counter or hanging from the ceiling; some crown molding, and maybe even a little floral-motif wallpaper. A country kitchen commonly will have round or oval kitchen tables with matching chairs. Besides perusing magazines, visiting home improvement centers and talking to friends to refine your choices, you can get started right away by filling out the easy form on this page to research a contractor to guide your decision-making. However you change your kitchen, just don't forget the most important thing--that fresh apple pie cooling in the window.